The past couple weeks I’ve been reading the Discworld series and I’m completely hooked. One of the main characters is Death, who walks around as a normal person, if a normal person were seven feet tall, a skeleton, and carrying a scythe. This character is always portrayed best when there is no regard to good or evil. Mephisto is a good example of this archetype in a completely different way. I imagined him as the cruel efficient tyrant that everyone hates but lives with because he made everything else so comfortable. Death is also one of the agents of order that reigns in the chaos of death. This dycotomy of order vs. chaos is going to be one of the core philosphies we get to explore. Can we we really call Death evil if all it’s doing is preventing our souls from being lost? Eh, really deep stuff for a light-hearted comic but still fun considering how epic our little 5 year mission is going to be. No, not the Pixar living machine flick, though I still maintain that it is by no means the worst of the Pixar/Disney masterpieces. No, I am more referring to the ability to draw cars, more specifically to the fact that I cannot do this. I really wish I had saved the original draft of my taxi cab; this time-jumping, black hole-afflicted slick piece of American manufacturing had so many structural inconsistencies, it wouldn’t have left even the modern production lines we’re cursed to deal with. Think the monstrosities kids make their first trip through wood shop and then scale it back a bit. So, in my fervor to complete something resembling a real-world automobile, I turned to Google. Almost immediately, I was greeted with numerous angles and sizes of taxi cabs, one of which fit my needs PERFECTLY. So, I did what any self-respecting artist would do in this pinch: I Photoshopped the heck out of the picture and called it my own. So I mentioned last week that I would post more about the process of drawing a taxi cab from reference, but really, what more is there to be said? I grabbed a great angled shot from Google, copied it, and recreated, by hand, the most perfect recreation of an automobile in the history of comic strips. Pretty self-explanatory, really. It looks so real, in fact, that I feel like I could jump in and take a ride, possibly with a chance to win cash prizes? 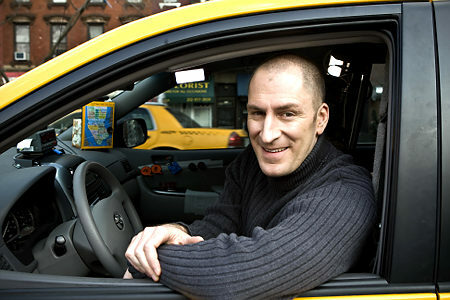 Sorry, any chance to feature Ben Bailey, host of Cash Cab on The Discovery Channel, is one I will always take. 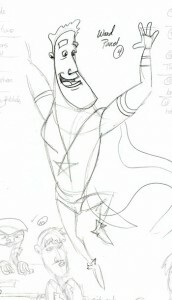 More on the current strip, including development sketches and a link to the production blog, in the next update! Stay tuned! In a hopefully ongoing feature, I’ll be posting some sketches and/or links to our production blog (also serving as my own personal sketch blog) that give some insight into the process behind the creation of Digital Strips Adventures. Webcomics are different and more organic than a simple printed page because they’re alive, they’re changing, and evolving right before our very eyes. Learning the process behind that evolution is extremely exciting to me. Now, whether or not that ends up being the case for this comic remains to be seen, but I figure it’s a possibility and so I’ll post what sketches and thoughts I can. For this page, it was my task to draw several, CE-familiar elements, including the gayest nightclub this side of The Toolbox, complemented by two proud, gay men, TJ and the Captain’s very own son, Ward!